as each-Spring renews the earth. And the message of new life and hope. While the egg itself reminds us of a new life and Resurrection, of life hidden behind the shell, the beautifully decorated ones have on their shells many symbolic and thematic representations. A detailed description of these motifs can be found in a variety of books now available. This contributes to a deeper appreciation of the artistry of this folk art with an eagerness to share with others for their deeper appreciation. 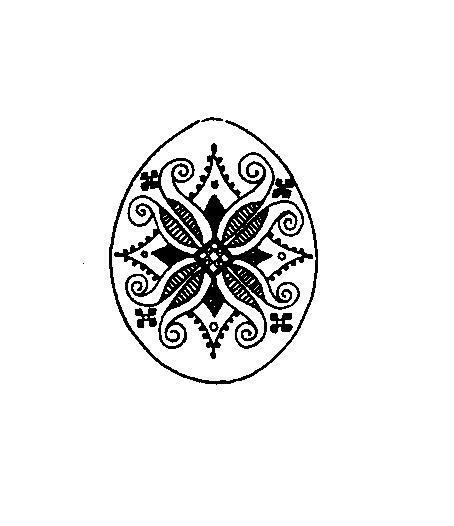 Use of the triple barred Cross which is characteristic of Orthodox believers is often Depicted on eggs. It calls to mind the events which led up to the feast of the Resurrection and our participation, as result, in the divine life of Christ. The Sun motif is the oldest used by man in decorating ornaments. 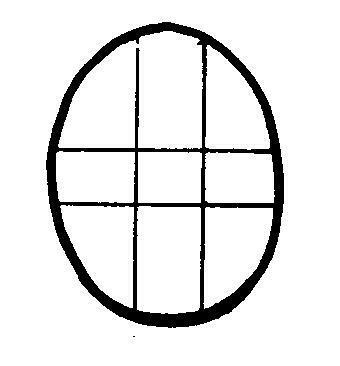 This thematic representation was also used for eggs at this season. From time immemorial, man believed in the mysterious powers of the sun and until the coming of Christianity, he worshipped it as a deity. Now Christ is the Sun of Justice Who leads us through the warmth of grace into a heavenly paradise. It also is reminiscent of the mourning of nature at the death of the Lord when the sun darkened its face. The Star motif is not only widely used, but very popular as well. Down through the centuries stars played a prominent role among our village ancestors. Before beginning their daily work in the fields, stars were consulted for assistance. 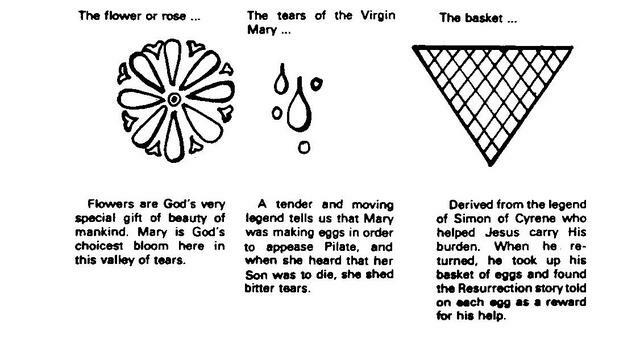 It was very early in the morning of the Resurrection that the pious women went to the tomb to find it empty. Christ is considered the early star of morning, having shed Resurrection light on the darkened world early in the day.. In pagan times it was believed that if a star shone brightly at a person's birth, they would have a long life. In most instances star designs were usually applied to the tops and bottoms of the eggs where they were most obvious. No one can forget that a star is associated with the beginning of Christ and pointed in His direction the Nativity, when in all truth He began to carry His Cross. Water is very essential to the existence of human life and to growth and progress for all people. Without water there is no life. Water is the essential vehicle of our re-birth and is associated with this glorious feast because it was chosen by the Lord. People always lived best near streams, lakes, sources of fresh water which always supplied them with food sustenance as well. The human necessity and dependence upon water is depicted by two or three parallel wavy lines or strokes. The bundle of wheat motif is considered by experts as being one of the most beautiful when compared with others which have a decorative use. Its us is based on the Lord's observation that a grain of wheat must be buried and die to itself before it can produce new life. He alluded to His own Resurrection but very few understood its implications. In addition, the use of wheat to make bread, especially the Paschal Bread for this feast is important. It also alludes to the heavenly bread about which our Lord spoke in sustaining our spiritual lives. There was another symbolic use made by some of more advanced artistic talent. That is the fish motif which is reminiscent of the early Christian practice of identifying themselves by the fish symbol. The acronym of fish (ICHTYS) in Greek means Jesus Christ, Son of God, Saviour, which finds its exemplification on this Resurrection feast day. It is also reminiscent of the fundamental baptismal vocation of believers to be fishers of men. There are a whole variety of decorations and motifs as well as patterns utilized by the myriad number of people involved in decorating eggs at this sacred time. As you become involved in it, undoubtedly, you will develop a few of your own. This is very delicate craft which actually has its roots in ancient pagan practice, but which was Christianized with the advent of Orthodoxy in lives of the people. The practice of decorating eggs comes to us form many different ethnic cultures, but primarily from those which have an Orthodox tradition, the only exception being a few Western Slavs who originally were introduced to Christ in the Eastern tradition,. but due to subsequent animosity from western Latin neighbors were overwhelmed and joined the Western confessions while still maintaining a semblance of Eastern influence. The Rusyns lived in the forests of the Carpathian mountains. Through their art form on this feast day they used nature as a pattern and expressed their deep inner faith. 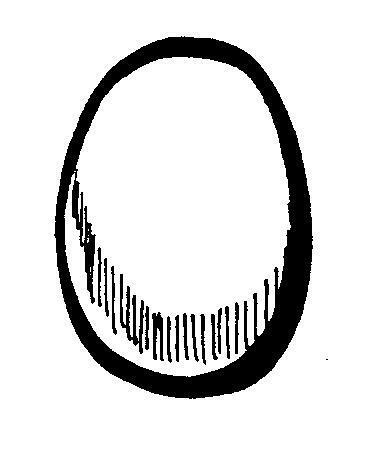 The decorated egg is a classic example of this. You should have no trouble getting these necessary items. Now that we have our materials together, we are ready to begin. 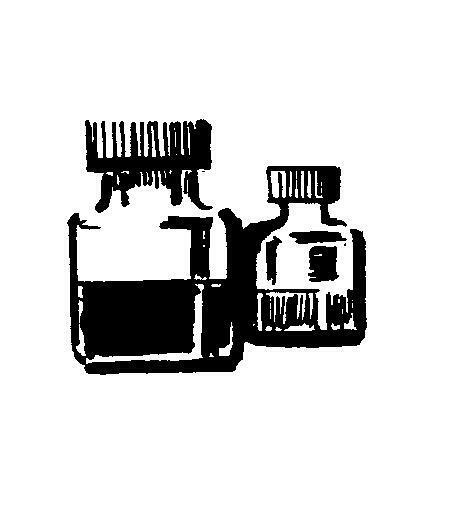 (1) Your dyes will come in little packets. Be sure to follow the directions on them and be careful when preparing your orange and black. I have always had a difficult time making these two colors. Also, I recommend that you label each jar since some colors do look alike. (2) Take your clean white egg, .watching that you do not leave any greasy fingerprints, and soak it in a bath of 1/4 cup white cider vinegar mixed with two cups of cold water. After about one minute, remove the egg with a spoon. Hold it in a clean rag and blow it dry. 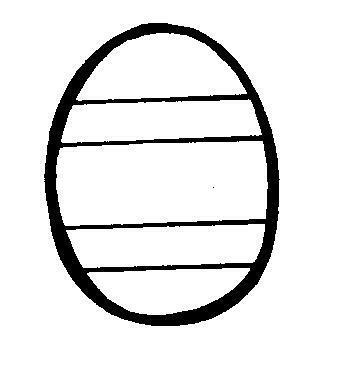 (3) Select a simple design and lightly sketch it on the egg. Never use the eraser. These sketches will serve as guide lines. 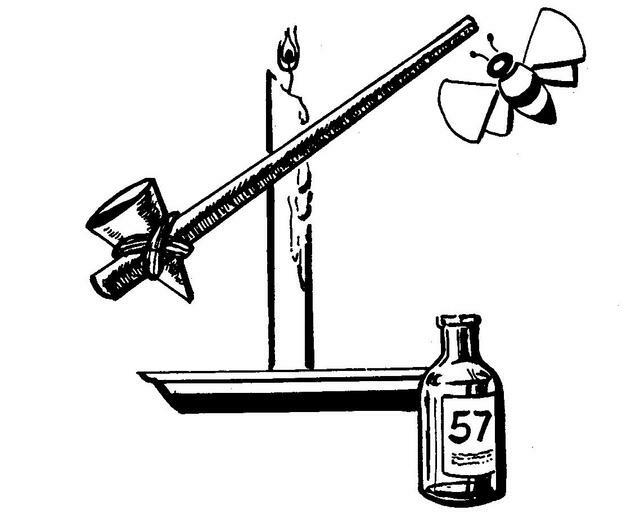 (4) Take the kiska, holding it like a pencil, and place the head of it in the flame of the candle. When it gets hot, scoop some bee's wax into the funnel. 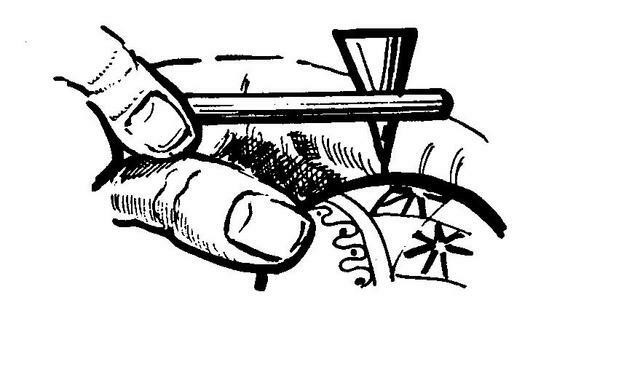 To see if the kiska will write properly, try it out on your thumb nail. Do not worry, it will not hurt you? When the line is the way you want it, use it on your egg. Be sure not to put too much wax in the kiska or to overheat it. You will get an ugly glob of wax on your egg if you do and you l not be able to do anything about it except incorporate it into your design. Remember, the wax lines you are now putting on your egg will be all white. Have you covered everything you want to be white? You cannot reverse the color order. You must go from light colors to dark ones. (5) Now the egg is ready for the first dye bath. With a clean spoon, lower the egg into the yellow dye. When the desired shade is obtained, remove the egg carefully and dry it in a clean rag. You might want to blow on the egg to speed the process. (6) Have you decided what you want to be yellow? Good. With your kiska, fill in those areas of your egg. Remember, the wax seals off those areas so no other colors will penetrate through it. In other words, do not apply the wax until you are sure of where you want it! (7) Now you have the general ideal Do the same for : orange, light red, dark red, purple and black. Do not forget, you must go from lighter colors to darker ones and this is a one way process. (8) Be sure that the egg is properly dried after every dye bath. Do not rub your egg. I would also suggest that you do not leave your egg in any dye bath for more than three minutes. (9) By now your egg should look awful) Do not worry. Beneath that, coating of wax lies a treasure. Your first Pisanka. All you have, to do now is remove the wax. Hold your egg next to the candle flame; not over the top of the flame but to the side. Gently wipe off the wax as it melts. (10) To finish the process, take three thumb tacks and push them through a piece of cardboard so that they make a tripod. With some fast drying clear varnish coat your masterpiece and set it on the tripod to dry. You may repeat this process until the desired gloss is obtained. In addition to increasing your artistic abilities, I hope that I have been able to make you more aware of God's great gift of eternal life, which the egg itself symbolizes. Here are four basic guide lines to put on your Resurrection eggs. First think of the motifs that you wish to use and then incorporate them into your design. Be sure that your egg tells a gospel story! 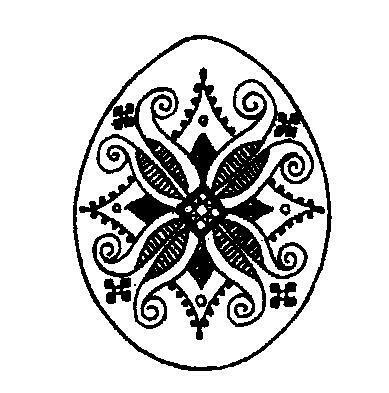 This first egg is divided into equal parts and can be used with almost any motif. It lends itself well to designs which use the Cross. This second egg will be excellent for star and flower designs. Many ideas and color symbols can be used here. Egg number three would serve as an ideal basis for any geometrical motif and the possibilities are as limitless as your imagination. Be creative! 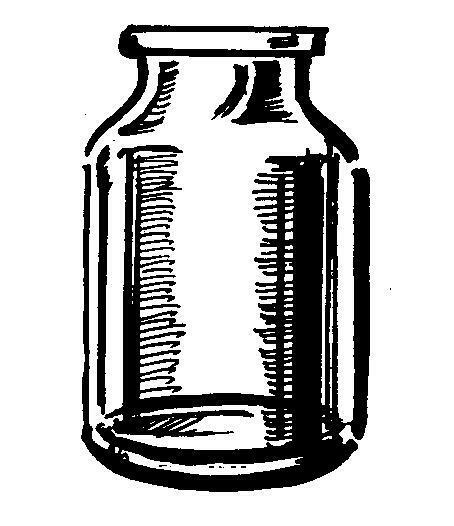 This fourth illustration has many possibilities. 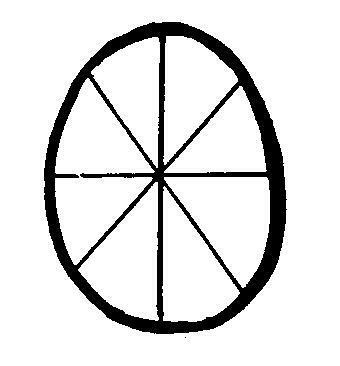 The unbroken circular can go straight across as below or any direction the designer may choose. People of the Carpathians have continued for many centuries the impressive and colorful tradition of the priestly blessing of Paschal baskets, laden with delicious holyday foods. 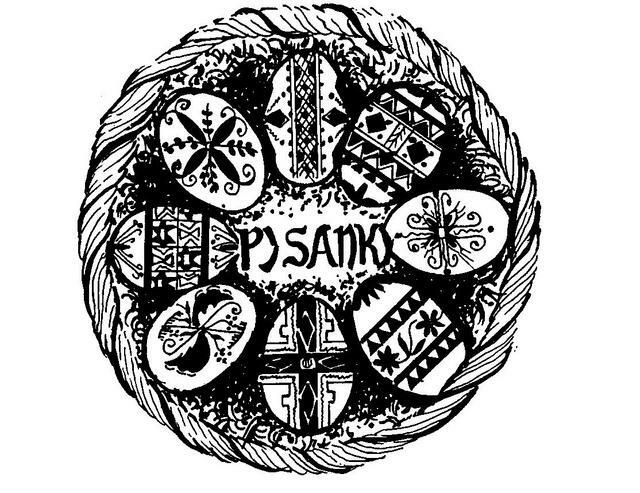 Included among these foods are decorated eggs whose symbolic and thematic designs inspire their description: in the Carpatho Russian language: Pisanki which literally means hand-written. 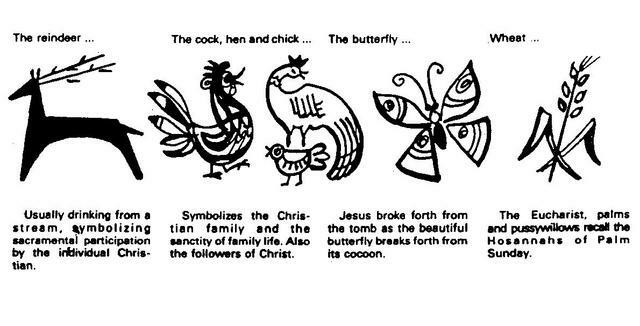 They thus become one of the most beautiful components of the Paschal basket with their varied colors and designs which symbolize new life and Resurrection as described in the verses:"
The Resurrection egg is a symbol of the miracle of birth and the beauty of creation as each Spring renews the earth. 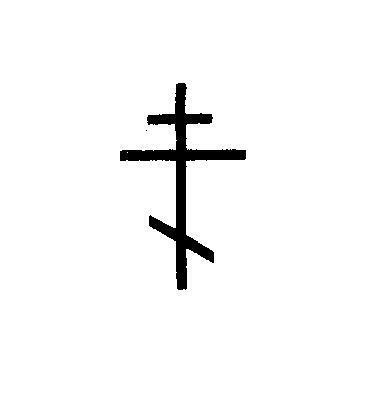 But even more, it represents Christ's rising from the dead and the message of new life and hope his Resurrection spread. While the decorated egg itself reminds us of new life and Resurrection, the beautifully decorated eggs have on their shells many symbolic and thematic representations or motifs of the triumphant celebration. A detailed description of these is found in many texts treating the subject. We can now obtain a newer and deeper appreciation of the artistry of our beautiful ethic eggs prepared for the celebration of this glorious triumphant Resurrection feast day. 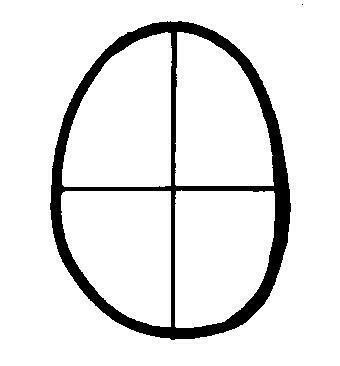 The traditional triple-barred cross of the Carpathian people since their conversion to Christ finds ample expression in the decoration of Paschal eggs. 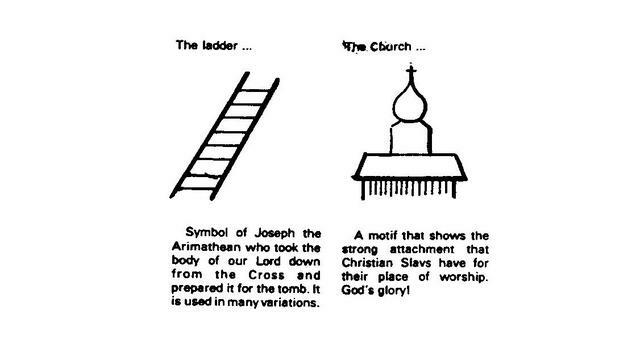 Not simply because it is easy to portray, but also because it is so expressive of the faith of the people and meaning of the holyday, the tripe-barred cross is used over and again as a symbol of the triumph of the Lord.